SANTA RITA, Guam – “We Build, We Fight” has been the motto of the U. S. Navy’s Construction Force, known as the “Seabees”, for the past 75 years. 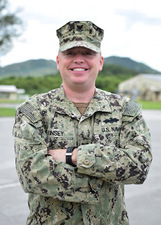 Today, Harrisburg, North Carolina, native and 2005 Central Cabarrus High School graduate, Petty Officer 2nd Class Brandon Kinsey, builds and fights with the Navy in Guam and around the world as a member of Naval Mobile Construction Battalion 133, based out of Gulfport, Mississippi. Kinsey works as a builder who is responsible for installing vertical construction, frame work and dry wall. Today, Seabees continue their innovative traditions, ensuring they always meet fast-paced challenges, according to Kinsey. Serving in the U.S. Navy has allowed Kinsey to continue learning about himself and the legacy he wants to leave to future Seabees.